Every Scout should have a first aid kit, know what is in it and, more importantly, how to use it. You won't necessarily need it at troop meeting nights as we will always have the group kit there, but you should certainly have it on hikes, camps and other events - after all the casualty may not be you and Scouts should be prepared to help others. Below are some guidelines for putting together, using and looking after your personal first aid kit. You will need a container to keep your first aid kit in. They don't have to be expensive and certainly shouldn't be too big. You just need enough room to keep the necessary items in. If it is too big you are less likely to carry it around with you and a first aid kit is no use if you hurt yourself on a walk but your kit is back at camp because it was too big to take with you. You could get the type shown in the picture above. Some are red, some are green, they are about the right size, not too expensive, usually have a loop on the back so they can go on a belt and are normally water resistant. They will be clearly marked as being first aid kits. You could, if you prefer, just use a small tupperware container. These have the advantage of being tougher and more waterproof but you will need to make sure you mark it clearly so everyone can see it is a first aid kit in case it is needed in a hurry. 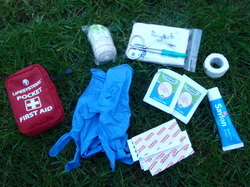 The photo and list above show the basics that everyone should have in their first aid kit. You may want extra items for yourself such as lipbalm in Winter or hayfever tablets in Summer, but the items above will allow you to deal with most minor first aid situations. Let's look at the items one by one and how you will use them. You should always have at least one pair of gloves in your kit. Squeeze the air out, roll them up and use an elastic band to keep them in small parcel. You should get non-latex (usually blue like those above but sometimes white - just make sure they are "vinyl") because even if you don't have a latex allergy, the person you're treating might. Gloves not only protect you from blood, vomit etc but also protect your casualty from the bugs on your hands. These can be used to clean your hands before you put gloves on but can also be used to clean wounds that are dirty. These kinds of cream often claim to promote healing but to be honest that is probably not likely. In clean wounds (and if it was dirty you would clean it with an antiseptic wipe) they don't serve much of a purpose BUT just the act of putting cream on a cut or graze will work wonders for some people and make them think it hurts less/is getting better! This is especially true of younger children, so it is well worth having in your kit. Bandages can be used to hold a large dressing in place or to support sprained limbs. If you have to deal with a cut that is too big for a plaster, use your triangular bandage (still folded up) as a dressing pad directly on the wound (after cleaning the wound if possible) and secure with the bandage. Wind the bandage around the area, overlapping the previous area by at least 2/3's and finish it off with a piece of tape to hold it in place. Using this type of bandage in windy conditions is difficult, use a second triangular bandage from someone elses kit (or a necker) as a bandage instead. In the case of sprains soak the bandage in cold water (as long as there is no broken skin at the injury site this could be river water or cordial from your drinks bottle!) as the cold will help reduce swelling of the injury and apply as above. it needs to be firm but not too tight. Keep checking in case the swelling is getting worse, if necessary loosen it slightly - don't obstruct the blood flow to the limb beyond! Wet the bandage regularly to keep it cold, elevate the affected area if possible. Triangular bandages are great as they have lots of uses. Get the sterile kind in a sealed packet then you can use it as a dressing pad as outlined above. You can use it as a bandage with the benefit that it won't blow around in the wind and fits well on hands, heads and limbs. It can be used for its original intended purpose as a sling. Fasten with safety pins or tape. To be honest it is often easier to use the victims own shirt, jumper or coat as a sling. Can be used to cut clothing away from an injury, cutting bandages into shorter, more useful lengths or cutting plasters to fit awkward shapes. Can be used to secure slings and can sometimes be used to gently lever splinters out. Have a selection of sizes. Learn how to put them on without touching the part that goes against the wound to prevent infection. 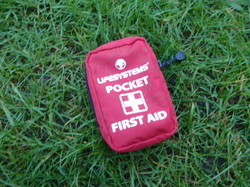 There are other items you may want to put in your kit (but remember this is a small personal kit, if you need to carry lots of other items they will usually be included in the larger, group first aid kit carried by the leader). Only add items that you know how to use. There are some suggestions below. Lipbalm - very useful in cold, windy conditions or when you are spending long periods around a camp fire. Blister dressings - carry these if you are prone to getting blisters. They are expensive but absorb moisture from the skin and swell to add a protective cushion over the affected area. Tweezers - good for getting splinters out. You won't need to add these if you have a small pair in the handle of your Swiss Army Knife. Alcohol hand cleaning gel - excellent for cleaning your hands before handling food/eating if you don't have access to soap and water. Also good for cleaning your hands before and after dealing with a casualty. Tick remover - a tool for, funnily enough, removing ticks! Ticks are small parasites that are becoming increasingly common in the UK, especially where deer roam, but they can be carried by hedgehogs, dogs, badgers and almost any animal. They can end up on leaves in the undergrowth and as you walk through can attach themselves to your skin where they will happily feast on your blood. They can cause an illness called Lymes disease which can be serious if not treated. If you find a tick on your skin it should only be removed with the correct tool, otherwise the mouth parts stay in the wound and it will get infected. Non-adherent dressings - good for wounds that are too big for plasters and especially for "soggy" wounds like grazes. They need to be held in place with tape or a bandage.